Recently, a dream of mine came true! I was handed one of those, HUGE checks... Publisher's Clearing House Style. There were cameras, balloons, loud cheers. Unfortunately, they misspelled my name. How did they get MDA from Ashley?! 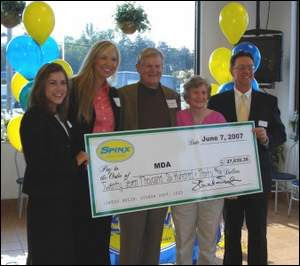 Ok, ok... so the check was from Spinx to the Muscular Dystrophy Association. A very worthy organization, and my employer. Mother Nature is relentless! This battle has become a WAR. Once again... Monday, the weather was ideal during work hours. Then, like clockwork, storms rolled in as I rolled out of the office. Because this has become such a regular occurrence, I've stopped screaming and waving my fist at the sky. My mind was already trying to come up with a counter attack plan. Swim. Going to the pool is to a triathlete --- What going to the movie theater is to most other people. A good rainy day activity. An escape from the crummy, dark, windy, STORMS! Unfortunately, She won this one. The INDOOR POOL WAS CLOSED DUE TO BAD WEATHER!!! Let me repeat the word: Indoor. Who knew?! Evidently, someone... somewhere was struck while swimming inside. I begin picturing an idiot standing in the water, holding a metal pole into the air. Was it a bad joke, did his "friends" say it was the new metallic noodle?! Then, somewhere between the pool and my house... I realized just how BAD the storm was getting. No chance Noel and I would be running in this one. It was the kind of rain that comes down so hard, you could shower in it. The huge, wet drops that result in the oh-so-attractive drowned rat look. High winds, super dark skies. Living in Illinois... this is when you hunker down for tornadoes. After a tough weekend (Saturday: 70 mile ride with 30 miles of 3 hard, 2 recover... 3 mile brick run. Sunday: 12 mile run). I'm sure my legs could use a break anyway. So I did it. Blasted some good music (Gypsy Kings), and broke out the cleaning supplies. Scrubbed the bathroom and kitchen floors. Did loads of laundry. Rearranged my closet. Put away things that have an assigned storage space, but always seem to be laying out. Made a trip to Home Depot... bought and installed a new toilet seat (does it get any better?!) Sprayed the house for bugs (yes, this is an old home... and with the feet of rain we've been getting, I think they're looking for dry land). Trashed old food - leaving my fridge with ketchup, various salad dressings, 1/2 bottle of white wine, some sandwich meat, and lemon juice. So, Mother Nature may have canceled my workout... but, the rain did not keep me down. Now, Please please please can we have an evening clear of rain! Thank you. Isn't this Great, aren't we so lucky to be doing this?! Help Me, Help Me, Aaaaaahhhh! Yeah, I'm going to need you to come in on Saturday, Sunday too. retired? You are a retard? Aren't we just the most beautiful people in the world?! In case you've tried to call me... I'm posting this message. My cell phone committed suicide yesterday around 11am. While I was visiting with my Granny, it jumped from a table right onto the hard, cold tile floor. An ugly sight indeed... the poor body instantly severed into 2 pieces. I think it was a quick death, painless. A replacement is on the way... but, I don't think this new cell phone can match up. I had things stored in the memory: pictures, friends singing songs... and IMPORTANT PHONE NUMBERS. The Verizon geek told me they probably won't be able to retrieve the contact list. I might have to send out a request for you to fwd your #. But, I'll do my best to avoid that. 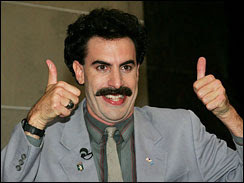 When the transfer process is complete... I'm burring the powerless phone pieces with Peter's old bike components. It will be a sad ceremony. It has been like this all week: I'll wake up to a gorgeous day, go to work... and look longingly at the sunshine, right outside my windows. Just a plate of glass separating me from the great outdoors. Knowing that other people are on their bikes, walking, running, in line skating, playing basketball, golf, jumping on their trampolines... I'll watch my clock creep to the 5 o'clock hour, jump into my car, drive home... and then, just as I'm changing for the day's workout... clouds will move in, and the rain starts falling. EVERY day so far. Monday, Tuesday, Wednesday, and Thursday. And, when I say rain starts coming down... I mean RAIN, the BIG drops. We're talking: thunder, lightening, and the drops you mistake for hail (wait, there was hail on Monday). Does Mother Nature have it out for me?! Have I recently done something to upset her? Nothing comes to mind... but, she continues to tease me. Spreading sunshine and warm temps over Greenville during the day, and then quickly yanking it away as I'm escaping from the office. She's forced me to skip a ride and run on the treadmill. I'm thinking about switching to aerosol cans and styrofoam... but, then she might really do some damage next week. Yesterday, she got on my last nerve. The day was Beautiful. At lunchtime, When I had to make a trip to the post office, I actually parked in the furthest spot from the door. I took my sweet time walking across the parking lot. How sad is that... in my effort to enjoy the nice day, I was buying time on the post office blacktop?! Anyway, I was jazzed about getting off work and going for a run. Seriously, the sky was clear as I made the 4 mile commute from the office to my house. 4 MILES! I changed into running attire... and as I was pulling my hair up, I heard Noel come through the back door. "it's raining again," she called. WHAT?! Are you kidding me. I threw open the door, and sure enough. Dark clouds had appeared and the rain was falling. My mood fell with it. 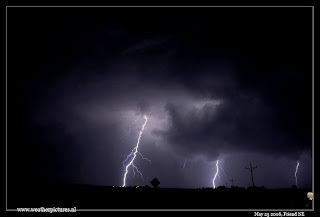 Then, I heard a clap of thunder... and my mood fell further. I was ready to throw in the towel. Mother Nature had won. Time to change clothes, curl up on the couch, and eat ice cream. "What are you going to do?" Noel asked. Plan "become a lazy ice cream eating bum" was on the tip of my tongue. But, I couldn't let Ms. Nature win again. She'd been beating me all week... and this time I wanted to fight back. "Lets go run," I said. "Yes," responded Noel, with a smile. We agreed that running in the rain could be fun... as long as we didn't get struck by lightening. I hear those lightening bolts can really smart. I grabbed a cap to keep the rain out of my eyes, Noel changed... and we were out the door. No ipods for either of us today. Just the sound of constant downpour - interspersed with thunder, ambulance sirens, and car horns (I love that people honked at us, like we didn't know we were running in the rain... thanks for the reminder, we know we're crazy). As usual, before starting the run, Noel and I agree on an easy pace. This time, we actually did start out rather easy. (unlike the first time I ran with her... she took off from the door at about a 6 min pace. I literally had to stop and yell for her to slow down. She told me she just gets excited to run with someone.) I think Noel may be an illegitimate child of the Energizer Bunny. Not only does she keep going and going and going, but it gets faster and faster and faster. Anyway, the rain made for an exciting run. We kept our heads down, accelerated when the lightening seemed too close, stomped through puddles, laughed, and pushed harder. It ended up being one of the most enjoyable runs I've done in a while. We were soaked by the time we got home... dripping all over the kitchen floor. So entertained, were we, by our drowned appearance... we decided to hold a photo shoot. I'll add the pictures later... they're hot. I'd hate to run in the rain everyday, but yesterday was a fun change of pace. I felt like a kid, running through the park, actually aiming to splash through puddles. This weekend it's supposed to clear up - forecast calls for sun both Saturday and Sunday. Maybe I'll actually get out on my bike?! Let's hope so, 'cuz my running shoes are still soaking wet. Doing the set-up series races here in S. Carolina is great… they’re close to home. You can go race, come home, unpack, do laundry, recover, and be ready for work the next day. However, being close enough to sleep at home also has a downfall… you’re too close to justify shelling out extra $$ for a hotel room the night before. (don’t we spend enough as it is… Amen!) Therefore, you’re left waking up at 4:45 to eat, drive there (sometimes 2 hours), check in, warm up, set up transition, etc… Yesterday morning, waking up before 5 felt even more difficult than normal. Rewind to Saturday -- I was over at Peter’s house. 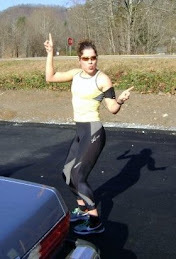 Noel (my roomie) came over to get us psyched for the race (note: Noel placed 5th at the Sunrise Run that morning. 8K in 31.55:43... ye-haw girl!). The three of us enjoyed the nice, HOT afternoon. Peter cooked a great pasta dinner. We sat on the porch, ate dinner, and watched ‘American Wedding’ (from the American Pie trilogy) on the laptop. As the movie wrapped up, I realized how dark it was outside. Suddenly… it hit me. I had done NOTHING to prepare for the race. Neither had Peter. It was 9:45 pm. - At 10:30 pm we were riding up and down his street (pitch black out, me in crocs, Peter in flip flops) testing out the shifting. I do not recommend this. - Great, of course my bike was having problems… back to Peter the mechanic. - So, what do you do once the bikes are put together and in working order? Duh, you take them apart and pack them into a car. - Well, then you have to pack your transition bag. It still cracks me up to have a pro (who has raced in over 30 IM races) ask me what he needs. Hello, haven’t you done this once or twice?! - Guys, you can make fun of me for having a check list (which I print out and go through before every race)… but, when you’re packing at 11pm the night before a race, it’s much easier to cross off the items and toss into your bag! - Next is preparing what you’ll need at 5 am. It’s best to have it out and ready… I’ve found I’m not at my most alert at that hour. - I set up my bottles like little solders – coffee travel mug, water bottle, race drink bottle, extra Gatorade for the ride. After my 4.5 hour nap… I was up again, getting the bags, wheels, bottles, maps, snacks, and sleepy people into the car. Off we went to Greenwood. I knew we were headed in the right direction as we joined the tri-geek parade toward the State Park. Then, as we turned into the park, it hit me. Must go to the bathroom NOW my stomach screamed. I stopped talking and focused on my breathing. We’ll be there soon, I told myself. Ah, funneling the triathletes into that park soon felt like sitting on I285 in Atlanta at 4pm on a Friday. We were going slow, too slow. There were state troopers waving cars on through to the parking area… they would not let us stop, I could not get out. As we passed the port-o-potty station, I looked longingly. We continued with the flow of cars to the back of the park. It felt like we were a mile away from those beautiful, blue towers of relief. Without batting an eyelash, he told me to grab my ID & USAT card and put on my running shoes. “Here’s our warm-up.” And we ran, sprinted to the line… the line of people waiting to occupy the highly anticipated location. While waiting in line, I went through a few phases. Elation – finally being at a bathroom. Tears – because my stomach was on the verge of explosion. Dancing – because if I stopped moving, I would have died. Finally, it was my turn. And we’ll skip the next part. We got in line to check in and get our numbers. Then, we did warm-up run #2 back to the car. Wow, run #2 felt so much better… hum? Bikes unloaded, race wheels on, drinks ready, backpacks on… we road to transition. The swim for this race is unique. Swim start / race finish are located on the other side of a small peninsula that jets out into the lake. (see the picture). As I was setting up my bike and unpacking shoes… I took a glace at the lake. Slight chop was evident, but I didn’t think anything of it at the time. Once everything was in order, I grabbed my goggles and cap, and hiked it to the start. Oh boy, here’s where the fun begins (NO, the fun didn’t start during my port-O-potty sprint) Like I said, the swim start was not next to transition. So, getting a good look at the swim course, 10 minutes before the gun was to go off, was rather alarming. As the race director advised, “you swim to the sun… once you get there, hang a left.” Seriously, I could not see the 1st yellow turn buoy. On top of that, the wind was picking up, and the waves were growing. Well, it was a 4 wave start (men 39 and under, men 40 and over, all women, and novice)… 4 minutes apart. Since we had a wave to follow, I figured sighting wouldn’t be a problem – just follow the guys ahead. Oops, wrong. The 1st wave left… 4 minutes later, the 2nd wave was off. I jumped in the water and kept looking for the 1st turn buoy. Still, I was just looking straight into the sun. Trying to get a good position in the mass group of women… can’t find the buoy yet. And, then the gun went off. Oh well, swim to the sun! I fought hard to stay with the leading women, for about 50 meters ;)… but, because of the sun and serious chop… I had no idea where I was. While sighting, I could see the wave of men that left ahead of us. Just sight those guys, I told myself. *I should have realized the people I was relying upon to be my guide dogs… were swimmers at the tail end of the 40+ age group. Seriously, Ashley… if you can’t see the buoy, what makes you think these guys can?! Soon, I felt alone in the water. I had passed the 2 first red sight buoys (you can go on either side of these, but must go around the outside of the yellow turn buoys)… so I thought I was on course. I was passing men from the 2nd wave, but something felt wrong… what was going on? I actually yelled to myself under water. I punched my fists into the chop and realigned my angle. Then, headed to the yellow buoy to make a legal turn. After finally making it to the 1st turn, I tried to increase my speed. The waves were hitting my right side, luckily I only breathe left. I actually enjoyed the rough waters. 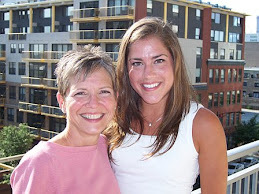 It was a challenge, a different kind of swimming… and, I assumed I was really far back in the women’s field. Thankfully, the race director had announced that the orange buoys are for sighting only (you can pass on either side)… ‘cuz many of them had moved off course. I set my sights on the next yellow. After turn #2, I felt fingers hitting my feet. Hum, who’s there… it lasted for awhile… then Miss Katie Malone moved up next to me! AH! We must have both gone off course. Ha ha – the blind leading the blind. Now, it felt like our workouts at her lake. She was taking it in fast, and I tried to stay with her. 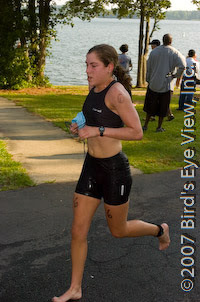 She and I were out of the water and into transition together. As I looked at the elite bike rack, my pony wasn’t the only one there! Phew. Interesting swim for sure. The bike course was fun. Since we had started in wave 3… there were lots of guys already out there. (in the other 3 races I’ve done this year, the elite wave started 1st… often leaving me to ride alone). As it was a USAT AG Nationals qualifier, there were many refs out there. And, girls… you know how guys can ride if they feel threatened by a woman! I hate the pass game – and one man in particular was giving me problems. Kimberly (a great cyclist) passed me within the first 15 miles… but, I passed a few women as well. Staying hydrated was what I focused on. It was a fast course – I stood up on a few hills, but it was mostly rolling. Again, Katie (who has become my “race buddy”… and I do mean race buddy, it feels like we plan dates to meet up in transition together!) and I were off our bikes together… putting on our running shoes and leaving TA. I was running about 20 yards behind her. Soon, I moved up next to her… but, my body did not like the pace. I think it was at mile 2 I saw Peter following the lead motorcycle. He waved his hand in my direction, and told me that the other girls were just ahead. Good for them, I thought. Around mile 3 Katie kicked it in… and I fell back. However, considering the hot weather, we both ran strong. A relay girl passed me (thank God for that R on her leg… I had no idea where she’d come from). The last mile was great. I thought I was in 4th place, and I was happy with that (considering the swim!). My bike had felt good… and although I hadn’t been able to keep up with Katie on the run… I know she’s a strong runner. I sprinted up the final hill – that’s right, the steepest part of the course is the final 50 yards straight uphill! As I crossed the finish line, I heard the announcer say 4th female. Good race, solid, no problems… but not GREAT. A fun day overall. Turns out that Peter had won, by just under 4 minutes! He even had the fastest bike split of the day, on his new Baby Fab! Looking over the results was really interesting. The swim times are all over the place (looks like some people were able to stay on course). I’m really happy with my ride… and I was right about Katie’s run (#1 female time of the day). I ended up with the 3rd fastest run (7 seconds over 2nd). This week has been a bit crazy... I can't believe Wednesday is almost over! So I did a race on Sunday, and I'm about halfway done with the way-too-detailed race report (you'd think I was writing about IM Hawaii or something). The short of it is that I placed 3rd Elite Female (but, 4th OA female... Gail, who got 2nd, wasn't in the elite division). Because I didn't know this, I took my sweet time at the campground showers... missing the awards. 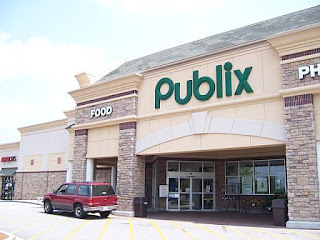 The Publix Supermarket on Pelham Rd. I love this grocery store. 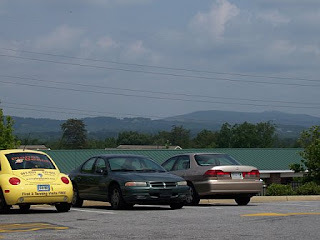 I can go on my lunch break, it overlooks the mountains, it has a great selection, fair prices, it's not crowded, and the employees are SUPER friendly. Here's to my #1 cashier: Harold... who always gives me the Senior Citizen discount! Upstate Fitness on Washington St. Thanks for the run Doug! Yesterday there was a mad storm (with hail even). I was NOT interested in running outside... and well, my friend Kate was working out w/ Doug (her trainer)... when I came in to say hello, he offered the use of his treadmill. The gym is fantastic! A++ on your bathroom and shower facilities. Spill the Beans on W. Main St.
Coffee and Ice cream at the same location... 'nuff said. This place rocks my world. Run In on Augusta St. Experts on running shoes... and good friends! Sometimes I just go to hang out. "Welcome to Moe's!" It's a friendly greeting each time you walk through the door. Then, they give you a burrito... does it get any better?! Yes it does, they serve beer! Going to the SMP is like a little vacation... only it's free. Bring on the sunshine! E.F. brought it up in a blog last week: baby showers. Yes, my friends are popping all over the place, and I’m ecstatic for them. I love babies, and I love it even more when close friends have babies… it’s like having a friend with a pool, you get to enjoy it without all the upkeep. Let them worry about cleaning it, keeping it full, and checking chemical levels (both pool and baby). So, let’s all share in the excitement and CELEBRATE… Peter had a baby! The stork (aka: FedEX delivery person), delivered the baby frame Thursday - June 7, 2007. 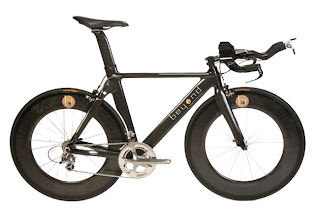 It’s a 3.3 pound, beautiful Beyond Fabrications Blink Carbon TT. Both Peter and Baby Fab are doing well. Here’s my idea: to those of you who have been invited to, purchased gifts for, and attended numerous baby showers over the years… now, it’s YOUR turn. I don’t care if you’re not pregnant. I’m sure some of you treated your bike shipment date like a due date… highlighting the day, crossing off the squares on your calendar, preparing a spot in your garage (or bedroom, if you’re one of those people), expanding your insurance coverage, priming the other bikes to accept a new family member, dreaming of fun trips you’ll take together, worrying you’ll fail to live up to the hefty expectations… and there’s always the fear that it’ll arrive with birth defects contracted during delivery. Peter, I say - start registering for gifts now. I’ll plan the shower. You and the Newborn deserve a fabulous party. Just imagine the response you’ll get upon calling Campagnolo… asking to set up a baby shower gift registry. I KNOW some of you are nodding your heads in agreement right now. You don’t have to tell me how awesome this idea is! We can throw the celebration in your garage. Instead of Name and Guest, invitations will say Name and Bike. Appropriate attire will include lycra, polyester, and spandex… even for the Men. We’ll have a fully stocked electrolyte bar: maybe we’ll get fancy with mixed drinks… hum, “I’ll have a Powertini please, shaken – not stirred.” Maybe we’ll even do some Clif Shots?! Only the finest energy bars will be served. Can you picture a 3 tiered bagel & peanut butter cake… lightly drizzled with chocolate gel? Once the party starts rockin’… I say we get down and dirty with group stretching. I’ll try my best, but it’s hard to control drug use during such crazy raves. No dealing EPO here please! If you’re into games, we could play an all-time favorite like, “Who can Change Their Flat Fastest? !” Or, a little “Spin the Crankset” perhaps… for those of you on the wild side? Did I mention this is a Saturday morning affair, set to start at 7:00 am? Well, after the festivities begin to wind down, we’ll set out for a group ride! If this party sounds awesome to you… here’s your sign: You’re a TRI GEEK. Peter, Congratulations on the new addition to your family. I hope you and Baby Fab have a wonderful and FAST life together. There will be many ups and downs (well, hills and descents), challenges (all out efforts)… these relationships are never easy. But, you’ll be there for each other through high winds, steep climbs, long rides, hot days, tough races… and you’ll make each other stronger. RIDE ON! The SE is known for many things: juicy peaches, slow talkers, kudzu, old plantation homes, humid weather, grits, magnolia trees, good football, beauty queens, friendly neighbors... and GHOST Stories! Since my mom’s side of the family was in South Carolina, we made pilgrimages from Illinois – across the sweet tea line – into SC a couple times each year. During these journeys, we usually spent a few days in the “Low Country” (native term for Carolina Coastland). Visiting this area was like going through a time warp… surrounded by buildings built in the 1700’s, walking on cobble roads, ducking beneath Spanish moss hanging from trees. These trips to Charleston, Pawley’s Island, Myrtle Beach were enchanting; what a difference from the Chicago suburbs! I can’t remember how it got started, maybe it was a history lesson of sorts… but, instead of your typical ‘prince saves the princess’ bedtime tales, Sarah and I begged my mom for Ghost Stories! Sally would climb in a bed between us, and recount paranormal legends… as if they were stories from her past. She told us about searching for ghosts in a graveyard with her college girlfriends; she detailed the stories of the “Gray Man,” and the tragic love loss of “Alice.” She had me so enthralled, that one night, I pleaded with my parents to drive me to Alice’s grave at midnight so I could see for myself. They were good sports, and waited patiently while I (along with my cousin, Lea… as if I’d go ghost hunting alone) snuck into the graveyard, summoned her spirit… and then came running & screaming back to the car… after seeing, what we swore was the ghost of Alice sitting in a tree. To this day, I enjoy hearing a good ghost story… especially while sitting around a camp fire, roasting marshmallows for s’mores (oh, that sounds good: note to self, plan a camping trip). However, I thought my days of being scared of ghosts were over. WRONG. This past Wednesday I rode with my friend, Brad, to Landrum, North Carolina. 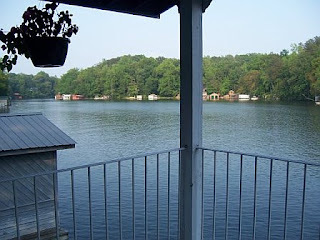 His coach, Katie, owns the cutest little house on Lake Lanier (right on the SC/NC border). Built like a 2 story dorm room, it’s right on the water… and perfect for open water swim training! The group: Katie, Brad, Chris, and I stripped down to our suites, grabbed goggles and bright-colored caps… then planned our route. Katie likes to swim along the shore for about 15 minutes before cutting across the lake, and following the bay area toward the dam. Well… it was a gorgeous day, so boat traffic was more of an issue than normal. When we stopped the 1st time, I could see concern on Katie’s face. At first, I thought her anxiety was due to the boats crossing our path. Oh no, she had no problem with the boats… evidently, it was an underwater silo that really freaked her out. Yes, I repeat: underwater silo (as in the tall, cylindrical structure usually on land to hold crops and such). “I hate the silo,” she said. “What, huh… silo… did you say silo,” I asked, while trying to catch my breath and keep my head above water. I rolled my eyes, and tried to concentrate on swimming. There was no room to think about creepy storage towers under the water. Well, because of the boats… we had to swim within feet of the eerie silo. No big deal, my thoughts were focused on keeping up with Katie. We pushed hard toward the dam… and then waited for the guys (ha ha, sorry Brad… you know I had to mention something about Pink Caps leading the way ;). After regrouping, it was decided to go the same route back to her house. “No, not by the silo again,” she moaned. Again, I didn’t think much of it. Katie set the pace, and I felt good, working hard to stay with her (well, toward the tail end of her anyway). Suddenly, she jerked to a stop… head above water, breathing hard. She was SPOOKED by the silo. Like a horse getting spooked on the trail. “Did I hit you?” I asked. “No, I just hate seeing the stuff down there… silo stuff… it’s right below us. You can see wood and junk on the bottom of the lake,” she said. Ok, here’s where I’m thinking… what-the-heck, let’s forget about the weird silo and swim on. To tell you the truth, I like that you can see to the bottom of the lake. Clear water is a GOOD thing. And if I have to see an old silo down there, at least I CAN see it. Well, after being spooked… Katie TOOK OFF. I mean: bullet out of a gun, cannon from the barrel, horse from the gate, Britney from the paparazzi, kicking and pulling. I jumped on her feet, just trying my best to keep those bubbles in sight. It ended up being one of the best swim workouts ever! GREAT. Now there’s a story to go with it. Before, I thought of the silo as some fish house under the deep blue. Now, it’s a symbolic memorial… it has history, and a past involving the death of teenagers. Yet another Southern Ghost Story. But, I’ll tell you what: Having seen “Alice” near her grave as a kid, I believe in ghosts. And the next time Katie and I swim near the silo… we’ll be sprinting together. *My Mom sent me this great story a few months back. Take a second to read it, and remember to love and care for your golf balls... enjoy your pebbles... and allow sand in your cracks... then, take pleasure in a good cup of coffee. Have a wonderful weekend! When things in your lives seem too much to handle, when 24 hours in a day are not enough, remember the mayonnaise jar and the 2 cups of coffee. A professor stood before his philosophy class with a few items in front of him. When the class began, he silently picked up a very large and empty mayonnaise jar and proceeded to fill it with golf balls. He then asked the students if the jar was full. They agreed that it was. "Now," said the professor as the laughter subsided, "I want you to recognize that this jar represents your life. The golf balls are the important things -- your family, your children, your health, your friends, and your favorite passions -- and if everything else was lost and only they remained, your life would still be full." "The pebbles are the other things that matter like your job, your house and your car." "The sand is everything else -- the small stuff. If you put the sand into the jar first," he continued, "there is no room for the pebbles or the golf balls. The same goes for life. If you spend all your time and energy on the small stuff you will never have room for the things that are important to you." "Pay attention to the things that are critical to your happiness. Play with your children. Take time to get medical checkups. Take your spouse out to dinner. Play another 18. There will always be time to clean the house and fix the disposal. Take care of the golf balls first -- the things that really matter. Set your priorities. The rest is just sand." One of the students raised her hand and inquired what the coffee represented. The professor smiled. "I'm glad you asked. It just goes to show you that no matter how full your life may seem, there's always room for a couple cups of coffee with a friend."